After his son was executed by police, a veteran is now using the settlement he received from the city to call for a new investigation into his son's death. Thirteen years have passed since one man’s son was fatally shot by police officers, and he cannot rest until his family sees the men who shot and killed his son brought to justice. 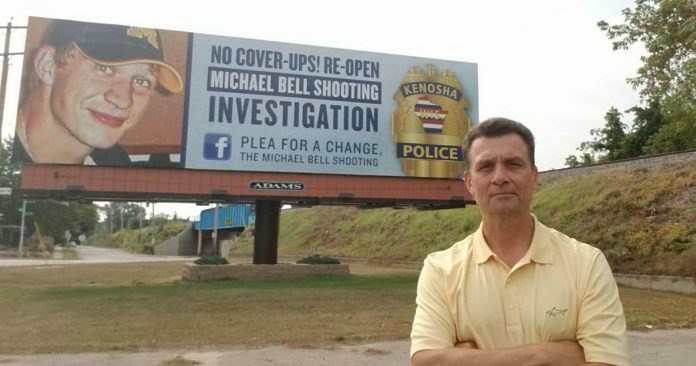 Unsatisfied with the turn-around investigation which, predictably, exonerated all of the officers involved, Michael Bell Sr. has now leased 24 billboards in and around Kenosha, Wisconsin, calling for an investigation into his son’s death to be reopened. Lt. Col. Michael Bell (USAF, Ret.) lost his son, also named Michael Bell, 13 years ago. After a night of drinking, Bell was reportedly the soberest of his friends and drove his friend’s SUV home early on the morning of Nov. 9, 2004. Kenosha Police encountered Bell in front of his own home. When approached by officers, he got out of the car. He was told to get back in and when he did not fully comply with officers’ commands, an altercation began, escalating to the point at which one officer shot the young man in the head, killing him instantly. Bell was unarmed when he was shot and killed in front of his mother, sister, and three neighbors. “I cannot even think of one time in my son’s life where he even fired a bb gun,” Bell Sr. said. At one point in the conflict, one officer believed the young man had taken his pistol and was going to kill him. After a third officer approached, he was ordered to shoot Bell, and he executed the young man with a carefully placed shot to his temple. Following the young man’s homicide, Bell Sr. used his influence and activism to change Wisconsin state law. Before Bell Sr. got involved, all law enforcement agencies were allowed to investigate officer-involved shootings themselves, essentially making it possible to easily clear their colleagues of any criminal wrongdoing, such as shooting an unarmed suspect in the head while he is being restrained by another officer. Following the retired Lieutenant Colonel’s vigilance, a new state law was signed April 23, 2014, by Wisconsin Governor Scott Walker. Now, when a suspect is killed in an officer-involved shooting, two independent investigators must be representatives from an outside agency (such as the State Bureau of Investigations, or another unrelated LEA). The LEA which is involved can be a part of the investigation but cannot be the lead investigator in the subsequent investigation. Understandably, Michael Bell Sr. now wants his son’s case to be reopened and investigated by an outside agency. “And I will tell you right now that’s why I am doing this,” Bell told PTP. He recounted case after case where police officers in Wisconsin were planting evidence at crime scenes and using positions of authority to steer investigations in the direction they wanted them to go. As a result, Bell has been taking out full page advertisements in newspapers like USA Today and others to highlight the police corruption and cover-ups he found in the city of Kenosha. The retired Air Force veteran believes other states should follow the lead of Wisconsin and make it a state law to require outside agencies to be a part of all officer-involved shooting investigation. He said his billboards were the reason why he was so successful in getting the state law passed. His two dozen billboards are currently on display 24-hours a day in Kenosha. For more information or to get involved, go to michaelbell.info. Officer Eric Strausbaugh committed suicide. He was the officer who claimed Bell had taken his gun. “I think he made an honest mistake,” Bell admitted. Officers Erich Wiedner and Albert Gonzales are still on the force. Lieutenant Krueger has since retired. Krueger, Strausbaugh, and Gonzales received the Meritorious Service Award in May 2005, which prompted Bell to take action, change the law, and now call for the reopening of what he perceives as his son’s unjustifiable homicide. “The problem I have is that the police department covered it up and tried to blame it on my son,“ Bell concluded.